March 8 is International Women’s Day; however, the women of the union movement like to celebrate. Consequently, sisters and brothers come together annually and pay tribute to the achievements of our movement in the struggle for equality, and this year was no exception. 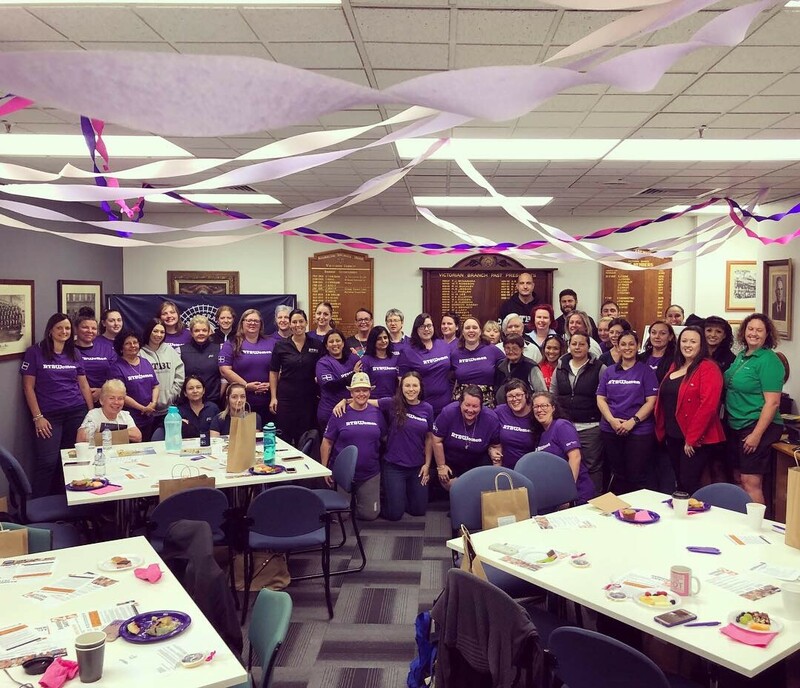 International Women’s Day 2019 was another great success for RTBU Women with many events spanning through the week to celebrate working women. The week began with the kick off event for the Women’s Right’s at Work (WRAW) festival on Friday 1 March with the WRAW Fest Gala. The Gala was a great night with sisters from across the movement and included speed networking, dancing and signing from the Trade Union Choir. It was a great kick off for what was sure to be a huge week of celebrations. The next big event for RTBU Women was the Feminist Movie Night on Tuesday 5 March which was organised by the RTBU, CFMEU, ETU and MUA. The evening was a great success with RTBU Women in attendance having the opportunity to network with members from other unions, share stories and hear from guest speaker Robynne Murphy from the Women of Steele project. It was also a great honour to have Ged Kearney, Member for Cooper and previous President of the ACTU as the MC for the evening. After a great night at the movie night, the RTBU held our Annual RTBU International Women’s Day Conference on Thursday 7 March with Women from across every Division of the Union there to discuss the issues facing Women in the public transport industry today. This year was the 9th RTBU IWD Conference and it is a massive achievement that 9 years later our conference is still going strong. Having been involved in the creation of the RTBU Women’s committee in 2010, it makes me extremely proud to see the event have such huge success and I thank Kellie Grayson, Hannah Scott and Briony Wilson for all their hard work both before and on the day. Events like these require a lot of organising and hard work to pull together, and it is thanks to their work and the support of the RTBU Women that we were able to pull together another great conference. It was great to once again see women from all divisions of the Union in attendance, as well as the CEOs of all the major public transport operators for the annual CEO panel. This year there was Raymond O’Flaherty, (Metro Trains CEO), James Pinder, (V/Line CEO), Jeroen Weimar, (PTV CEO) and Nicolas Gindt, (Yarra Trams CEO) who participated in the panel. Each CEO also brought a woman from each of their companies who is in a leadership role to also take part in the panel and this was widely appreciated and successful. It was also discussed for following years to have the panel of all CEOs break out into individual sessions for each CEO to discuss issues with women who are employed by their company. This was agreed by all CEOs and we look forward to expanding the panel next year for the conference and the women in attendance having a further opportunity to discuss company specific issues directly with their CEO. Following from the RTBU Women’s conference, the RTBU participated in the International Women’s Day March and Rally on Friday 8 March (International Women’s Day). The RTBU contingent marched alongside sisters and brothers from the wider union movement with thousands of people in attendance for the rally. It was a great week of events to celebrate working women across the globe and I am proud of all the work of RTBU Women in making it an unforgettable IWD week. A union is only as strong as its members and with RTBU Women building strength we can continue the fight to destroy gender inequality. The next RTBU Women’s meeting will be at Melbourne Central Station on Thursday 11 April at 11am. I encourage Women from all Divisions and workplaces to attend.